The Enertex® EinPC² is a logic machine and visualization server for the KNX bus. 65,000 configurable functions allow complex control logics. 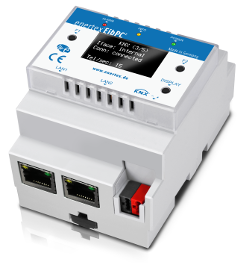 With the integrated KNX interface and ethernet switch, installing the Enertex® EinPC² is fast and easy. Integrated real-time webserver, encrypted remote-access, VPN-server, visualization of device status and bus telegrams, TCP/IP and UDP communication, e-mail, etc.